Even though baby teeth eventually are replaced with permanent teeth, undetected or untreated problems with baby teeth, can lead to problems with a child’s permanent teeth. For example, tooth decay in baby teeth, can lead to an increased risk of tooth decay in permanent teeth and affect the spacing of permanent teeth. Taking your child to a pediatric dentist early allows the dentist to take preventive steps before problems develop. It also is a good opportunity for you and your child to learn about oral health. A damage tooth left untreated can lead to bigger health problems in the future. With restorative care, our aim is to repair and/or replace the tooth before it can cause health problems or self-esteem issues. Restorative care procedures include tooth extractions, space maintainers, crowns, fillings and the treatment of nerves damaged by deep cavities. For anxious or restless dental patients, we can administer an oral sedative to reduce anxiety and help them cope with extensive dental treatments. With oral sedation, your child remains conscious during the treatment but may recall very little or nothing of the procedure. Nitrous oxide, also known as laughing gas, is a very safe sedative. The gas is breathed in through a mask and induces the patient into a relaxed state. Nitrous Oxide helps some patients cope better with dental treatments. Recovery is almost immediate. For complex or extensive dental procedures, General anesthesia is recommended. The patient will be unconscious, unaware of pain and relaxed. To help children overcome their fear of dental procedures, we use a number of behaviour guidance techniques, including Tell-Show-Do and the modeling of the desired behaviour by a sibling or a peer. If an early orthodontic problem is detected, we can correct minor orthodontic issues in a growing child or, if required, provide a referral to an orthodontist. We provide the specialized care and experience need by children with medical problems, developmental delays, autism, or craniofacial deformities to maintain oral health. We’ll teach parents and/or caregivers how to prepare and de-sensitize a child to the dental environment over a period of time. For those that require it, we offer general anesthesia at either BC Children’s Hospital or at a private anesthesia facility. 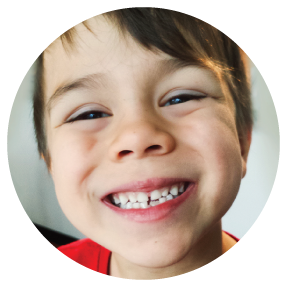 To help teach children how to take care of their teeth, we will come to your location or arrange for you and your class to visit the Half Moon Dentistry for Children’s office in Surrey, BC. It will be educational, but more importantly, fun! Mouth guards reduce the incidence of dental injuries from sports accidents. Get your active child into the habit of wearing a mouth guard whenever playing football, hockey or other contact sports.